I Sri Bhulumani Talukdar, W/O-Sri Ratul Dutta, R/O- Vill- Subankhata, Bhogpara Nonke BLK-A, P.O.- Nikashi, P.S.- Mushalpur, Dist- Baksa, BTAD (Assam) That my husband is a self employed person. We have two minor children, one is 7 years and another is 2 years only. He has been suffering from CKD 5stage (Cronic disease) from 12th April, 2017and he was under treatment at Apollo Hospital, Chennai and when the month of February, 2018 my husband became serious condition at home. We took advise of Dr. Anup Kr. Barman (Nephrologist) at Guwahati (Assam) as per his dignos my husband's both kidneys are totally damaged and need to be transplantation as per quick as possible and as per advise of Doctor he is presently admitted in the Rabindra Nath Tagore International Institute of Cardiac Sciences, Kolkatta for necessary treatment and transplantation of kidney. But it will not be possible on the paid of me alone to bear such a huge amount of cost for treatment and transplantation. 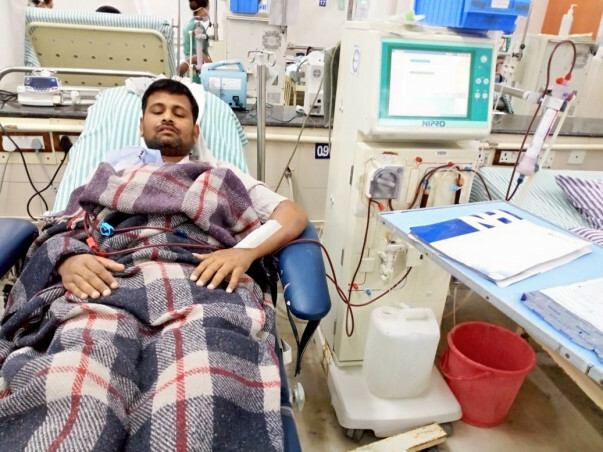 Now I am totally bankrupt after providing treatment April 2017 to April, 2018 presently he is on dialysis and under treatment. So, dear friends, well wishers please help us financially to save Ratul Dutta, (my husband and my family) in over coming my husband's kidneys transplantation and treatment. It is my humble prayer to you. I have some unfortunate news to share with you all today. My husband is no more with us. He passed away due to hyperkalamic cardiac arrest. The funds have been utilized for his medical expenses. Thank you all for supporting us. Dear friends, please help us and save my husband and my family.we have done all formalities for kidney transplantation.The Dr.asked us when we will take the operation date.But we have no answer.Because we are not fully prepare financially.So,we will not take the operation date.On the other hand ,my husband condition is very bad.He take two times dialysis in a week.Now he is to week too cannot walk.I have no way to collect the such a huge money.We come from a poor family.He is the only income sourcer of our family. Dear friends,well wishers, please help us as you like.Your a small contribution can save my husband and my family.Dear friends and well-wishers, please share this post again and again within your friends circle.This is my humble request to all.I hope positively that your valuable contribution can save my husband and my family. Safe my father Ratul Dutta's (43 years) life please. Our father's both kidney have already damaged due to KIDNEY STONE INFECTION and presently in critical condition, under treatment of DR. D.S. 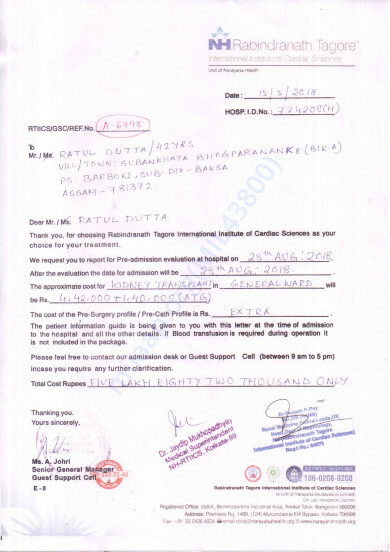 RAY of RABINDRA NATH TAGORE INTERNATIONAL INSTITUTE OF CARDIC SCINECES, CALCUTTA and on dialysis. Dr. diagnosed and advised for TRANSPLANTION as per quick as possible and estimated cost for TRANSPLANTATION is Rs. 5 Lakhs 82 Thousand plus 1 Lakh 40 Thousand for doner's operation and plus medicine and other charges extra. Thus minimum Rs. 12 Lakhs need urgently. It is impossible to bear this amount for us. We can get back our father from your valuable help. PLEASE HELP US to get back our father from this critical condition. Your a little help is much valuable for us.